When we see our kids fall, we rush to soothe them. A bruised knee warrants tender care and comforting. An altercation on the playground brings out the mama bear in us and we swing into action to set things right. A task done contrary to our expectations gnaws at that perfectionist within and at some point we realise that it’s time to let go of the inner control freak. Gy has always been a dreamer of sorts. She is the kind who will stop and stare at an ant because it looks tired. Her footsteps will slow down to delightedly watch a kitten chase an imaginary string or gently lift a flower that has fallen off the plant but is still fresh enough to last another day in a vase at home. Contrast this with me, who’s always been a bit of a stickler for duties and tasks. I can enjoy the sunset, gaze at a flower, relish the stillness all around, but only when I am done with my tasks for the day. It’s not the ideal way to live, I know, and there are moments when I chuck everything into the air, forget my chores and just spend my evenings doing nothing at all, savouring it with every breath of my being. So, it’s natural to understand why Gy and I would be at loggerheads when it comes to things to do around the house. It’s a constant battle of wills where I want the task done ‘right now’ versus her promise to do it ‘in five minutes’. It’s a different matter that her definition of five minutes is vastly different from mine. After a long time of snapping at her for not doing things the way I wanted, it was time for me to exercise the simple power of one word. It was ‘Yes’. It took effort and I tried not to limit her by constantly saying ‘No’. For a long time, that worked. But, if parenting has taught me anything, it is that nothing is constant. Our children change, ever so slowly and perceptibly. What worked for me a year ago won’t work anymore. Today, I cannot expect that even one day will the be the same as the next. As she inches closer to nine years of age, I realise that a young woman is growing right under my nose, one with feelings, decision-making power, partial control of her emotions and the ability to discern good from bad. She chooses to do what she can, when she can. What did I think? My heart was doing the back flip in a complicated acrobatic sequence! Instead, I smiled and agreed. In fact, I offered to help her, but she brushed it aside, saying, ‘You have enough work as it is.’ And that was that. No instructions. No threats. No deadlines. Doing something because your inner voice tells you it is time, is infinitely preferable to anything else. It was at once beautiful and inspiring to see a child take charge of herself and nudge me towards my own inner peace. Tomorrow, I’ll probably lapse into that control freak of a mom who wants that plate cleared away in the next three minutes, but for today, let me remember this lesson from a person who is younger than me in age and infinitely older than me in wisdom, maturity and self- acceptance. May that always be the case. May I just say I had “book book book” running in the back of my mind as I read this? Maybe a parenting one is meant to be first, I feel like just a collection of your blog posts would do :). So sweet and wonderful. My younger son is almost 9 as well. Of late, I've seen that procrastination has become quite normal for him. But since the school reopened this year, he takes his books and does all his homework without me asking him. Such a pleasant change this is. On Saturday, when his elder brother is off to school, he and I are alone at home and he is so well mannered. We even go over some lessons together, and he is in general receptive to do things around the house. But, there are times, when he is so cranky, he will just not listen. Ah, kids! What a heart-warming read, Shailaja. Reminded me of a young Vidur so much! One of the things I am ever-grateful for is his penchant for routine. Start him off on one thing and he'll do it exactly the same way until we change it. One of those things was finishing homework as soon as he came home and then, regale us with stories of his day. The most delightful thing. My Mom often said that it is parents who think we've said something so many times – but the only time that matters is when the child actually listens. 🙂 So mission-accomplished! I really shouldn't comment about this. I'm the king of procrastination. But good to know that Gy is keeping you on your toes and teaching you those all important lessons. Kids are so much mature than we give them credit for, and this sometimes happens with adults too. It is so heartening to realize that we should let go of that illusion of control once a while, but easier said than done. I can relate to this on so many levels. For me, it's silly small things…fridge should never have half filled bottles, all things should be kept at their proper places after use, doing things my-way etc etc. But as AG is learning to have his own individuality, learning to take decisions, I am learning to let go and looking at things from his perspective, which though different from mine is also right. So, yes, we have a lot to learn from our kids too. Love the relationship you share with your lil one. It gets difficult for me too to let go of my controlling side..especially the silly things.. I only have a 3 year old and I can vouch for the fact that the struggle is real. Maybe someday (in the very distant future) I may decide to take a chill pill. Someday.Who knows? One lives in hope. Well, I doubt that you are, but thanks for the vote of confidence in Gy 🙂 She is a blessing, really. It doesn't come easily to me either, Natasha. I try and possibly fail every single day. That is something I thought too, Shantala, that I would never change. Because change is hard, uncomfortable and very messy. When you do it though, there is a sense of powerful affirmation which makes you realise this is the right thing to do. It is a lesson I am taking from your lil one. 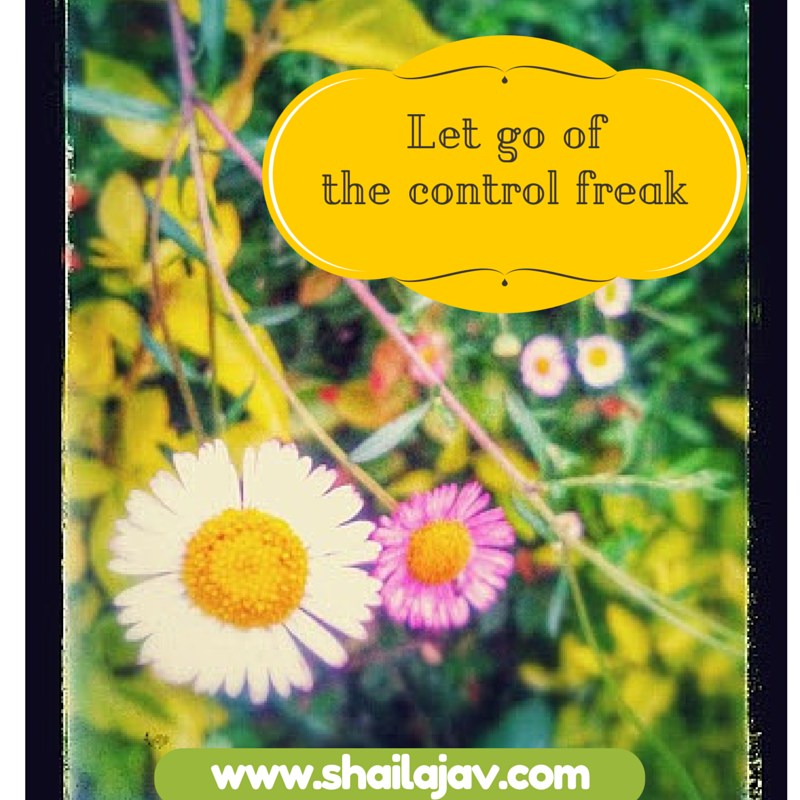 I take things easy and sometimes it's good to be a control freak to get things done. Uff what a topic you've come up with. I've watched forever as my son struggles to tie his shoelaces or my daughter tries to frame her sentences. It seems way easier to reach out and do it for them yet I have to hold onto myself. And sometimes even accept a less-than-perfectly done task. It's a hard one.